What will you make for your own dessert this weekend? Maybe Jelly with Pandan Leaves and Milk (Thạch Lá Dứa với Sữa) is a good choice. From many amazing Vietnamese Dessert Recipes, here is the favorite dish of my family. After take a nap, enjoy one cold jelly glass is perfect. Don’t you think? Moreover, you can serve them for guests when they visit your house. So, are you ready to discover one of stunning Vietnamese Dessert Recipes like this one with me? If you say Yes, feel free to follow my instruction below and let us start making it right now, ok? 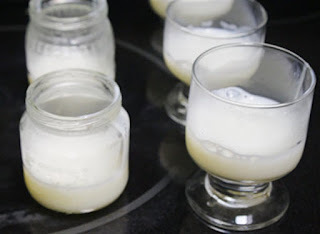 Making white jelly: 1 teaspoon jelly flour (agar agar flour), 400ml milk no sugar, ¼ bowl sugar. If you want it more delicious, you can add use 200ml milk no sugar with 200ml coconut milk. 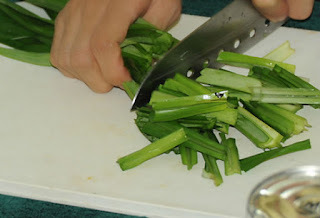 Step 1: Clean well pandan leaves, slice into short pieces. 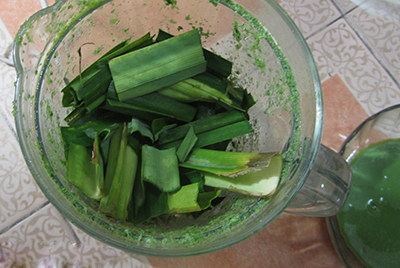 Step 2: Grinded well pandan leaves with 200ml water. Step 3: Filter to get the smooth water from pandan mixture in step 2. 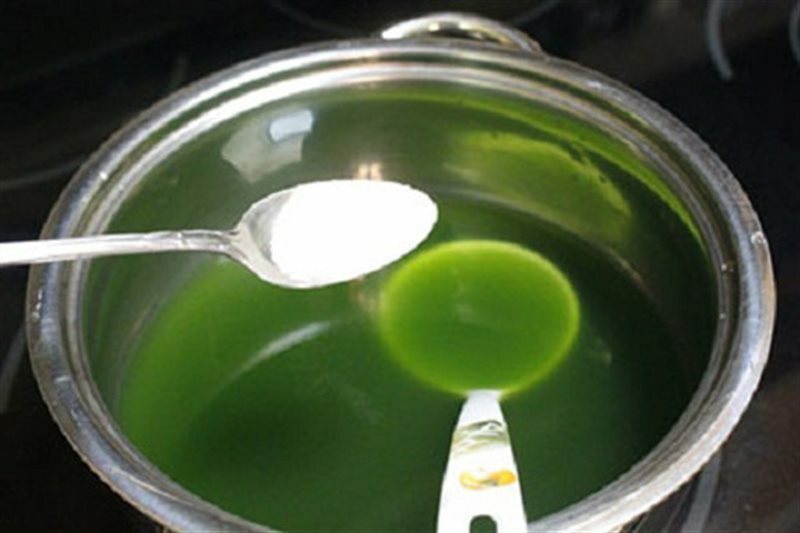 Step 4: Next, mix jelly flour, sugar and 200ml water with pandan water in step 3, stir well and wait in 15 minutes. Step 5: Put on cooking stove and cook with small heat. Do not stop stirring when cooking. Cook until sugar is melted. Here is also one of important step to create the flavor for this dish which comes from many amazing Vietnamese Dessert Recipes. Step 6: Mix sugar, milk, coconut milk, jelly flour together and bring to cook until sugar is melted. Do not stop stirring when cooking too. Step 7: Add 1 spoon of white jelly in step 6 into glass; wait to its surface is nearly thick, pour slowly 1 spoon of green jelly in step 5 into glass too. Make sure you will pour gently and do not break the surface of white jelly. Repeat this step to create many layers. Finally, your dessert is finished. Wait to reduce heat and put on fridge. Serving when it is cold is perfect. You can store in fridge for few days. How do you feel? 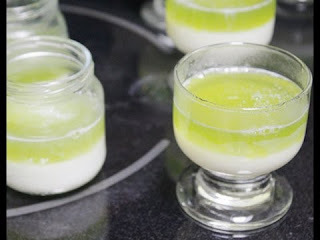 Hope you satisfy with one of stunning Vietnamese Dessert Recipes and Good Luck for your Cooking.